Qualcomm silently announced the Snapdragon 675 SoC back in October last year. It was supposed to occupy the premium mid-range segment thanks to its high performance A76 cores based on the Kyro 460 architecture. The Snapdragon 675’s value proposition was expected to sit somewhere between the Snapdragon 660 and the Snapdragon 710 considering the naming scheme, of course. While there have been many rumours regarding its performance since the announcement, we didn’t come across solid enough until now. 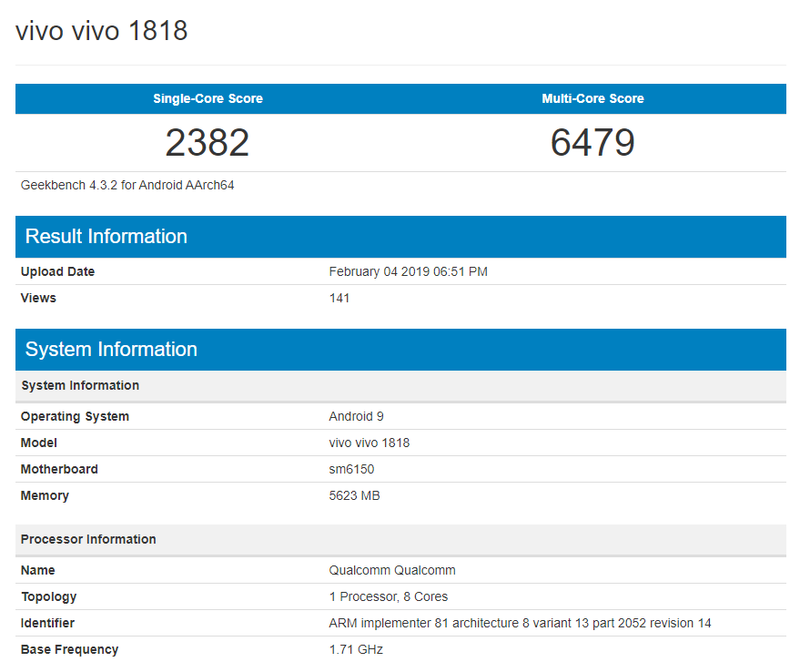 Yesterday on Geekbench, appeared the Vivo V15 Pro labelled as ‘vivo 1818‘ powered by the Snapdragon 675 chipset clocked at 1.71 GHz and the benchmarks scores are pretty surprising. The 11nm SoC supported by 6 GB of Ram managed to score a total of 2382 Single Core points and 6479 Multi Core points. The scores seem to be impressive at the first glance. But things get spiced up when you try to compare them to some other processors in competition. How does it compare to existing processors? 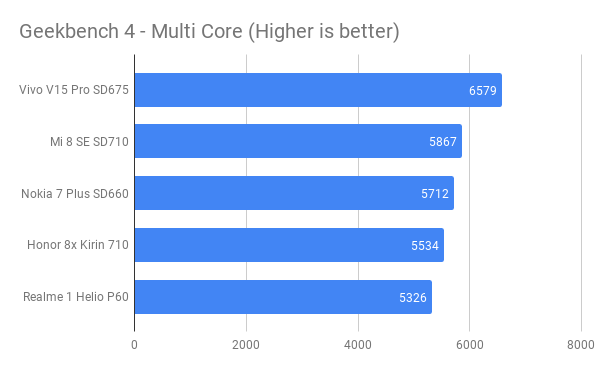 Here’s how the Snapdragon 710, Snapdragon 660, Kirin 710 and Helio P60 stack up against the Snapdragon 675. The Snapdragon 675 simply crushes all the other processors in the same price bracket. 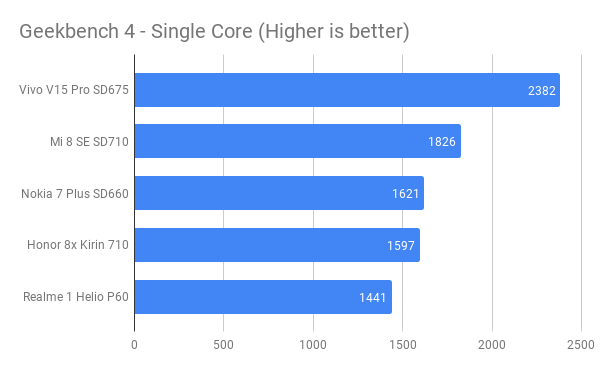 The shocking thing is, it also beats the Snapdragon 710 by a good margin in both single-core and multi-core scores. Its surprising but still good news for both Smartphone manufacturers and Customers. The Redmi Note 7 Pro and the Vivo V15 Pro are one of the very first devices to feature the Snapdragon 675 SoC and both these devices are rumoured to launch in February. With that being said, we should be able to confirm the final benchmarks scores pretty soon.